A hot startup company is way more fascinating to Americans than the financial turmoil engulfing a country that's been around for thousands of years. At least that's the takeaway from U.S. search traffic on Google. Greece may be teetering on the edge of default, but that's not bothered too many Americans. U.S. users who turn to Google (GOOG) are twice as likely to search for "Uber" and 10 times as likely to search for "jobs," according to an analysis of U.S. Google Trends data by ConvergEx. Even Taylor Swift is beating out the birthplace of the Olympic Games that is now home to 11 million people. 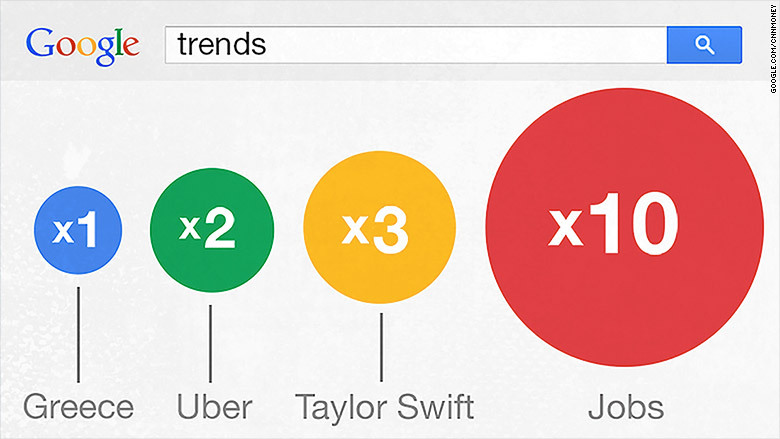 Swift, the American popstar who just outmaneuvered Apple (AAPL), draws three times the number of searches as Greece. "One person versus a whole country, and the country loses. In other words, American consumers think a lot more locally -- and personally than globally," Nick Colas, chief market strategist at ConvergEx, wrote in a Tuesday note to clients summarizing the Google Trends findings. Interestingly, searches for "Greece" in the U.S. are roughly the same as they were in the mid-2000s -- long before the never-ending saga over Greece's debt problems. Google users did ramp up their searches during the height of the crisis in 2010 and then again last summer. But they've come back down since then. All of this shows how the Greek crisis isn't rattling everyday Americans -- despite the daily gyrations in financial markets, especially overseas. Global stocks -- including in the U.S. -- soared on Monday after Greece made progress with its creditors on a deal to release 7.2 billion euros ($8 billion) in bailout loans. Greece needs the cash otherwise it could default on loans from the International Monetary Fund. The fear is that a default could force Greece out of the eurozone, wreaking havoc on its economy and calling into question the future of the currency bloc. Related: Is it time to consider a rainy day fund? It's probably not a bad thing that Americans aren't that worried about developments in Greece. After all, the U.S. economy is highly dependent on people shopping -- two-thirds of economic activity is driven by consumer spending. If the crisis in Greece had a chilling effect on consumer confidence, it'd be bad news for the economy.